So far, we’ve walked through installing the Webhook Shims. In this blog post we’ll configure the Orchestrator shim for use. The Orchestrator shim is but one of the handful of shims included in the solution. More are being added via the community. Participation is encouraged! In addition to providing a self-healing datacenter, Webhook Shims have capability for notifications, interaction with ticketing and CMDB systems and more. Check the file out if you wish, but here’s what we need to do to configure the Orchestrator shim. NOTE: Currently the .netrc functionality is not working – update is pending. For now, you can use basic authentication by modification of the vrealizeorchestrator.py and inputting the vRO username and password where indicated. That takes care of our authentication. By the way, if you are wondering why we need this; .netrc allows for automatically entering credentials. We changed the permissions on the file so that only the owner can view them. For those more experienced, if there’s a better way to do this feel free to leave a suggestion or fork the repo and take care of business! The second, and optional, change is to bypass certificate verification if needed. By default, the certificate for the Orchestrator server will be validated by the Python module making the request. If you are using self-signed certificate (such as in a lab) you’ll want to set this VERIFY flag to False. The server is now running and ready to accept requests! Note the port number is 5001. You should keep this SSH session open to view activity as you test. Let’s do that now. Open a browser and http to the IP address of the host running the Translation Shims on port 5001. Success! This is the default page for the server – lots of great information on all the shims available in this solution. Check it out. 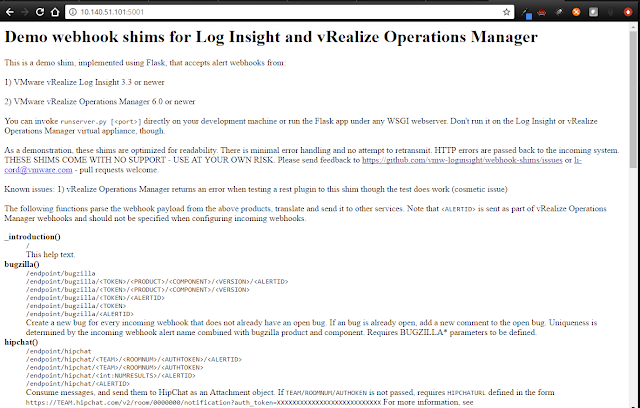 If you do NOT get this web page, then check the firewall settings on the host running the Webhook Shims. Is it possible to add multiple Orchestrator instance in this case? You would need to modify the shim to accept an instance selection input, so that you could control which instance was launching the workflow based on the alert notification.